Over the years, Impulse NGO Network has won several awards and been honoured by various global organisations for its exemplary fight against human trafficking and child labour. The Impulse Model was declared as the Good Practice Model in the South Asian Regional Initiative/Equity (SARIQ) and the Academy for Educational Development (AED) “Replicable Approaches Guide” – funded by USAID. 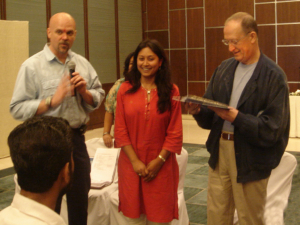 In May 2006, UNODC formally recognized Impulse NGO Network for its efforts in anti-trafficking initiatives. UNODC’s executive director, Antonio Maria Costa, honored the organization with a plaque. This acknowledgement from UNODC has provided even more recognition from the international community. The Impulse Model (Meghalaya Model) was also selected as a Good Practice Model for the WPC-UNDP Best Practice Research. It has been included for review in the National Integrated Plan of Action to Prevent and Combat Human Trafficking with Special Focus on Children and Women under the Ministry of Women and Child Development supported by NHRC, MHA, NCW and UNICEF. The Impulse Model was selected as one of the top three models in the world for its innovative development and practice. INGON won the second prize in the competition for Most Innovative Development Project category. Being awarded this prize has opened for wider regional replication of the model in Myanmar, Bangladesh and Nepal. INGON was nominated as a finalist for the category of Innovation in Telecom and Mobile Content and Application for Masses by the grand jury of the Billionth Award South Asia organized by the Digital Empowerment Foundation at New Delhi in June 2012. We were invited to make a presentation on the Impulse Case Information Centre which drew a lot of attention and interest from fellow participants, experts and key stakeholders who have extended invitations for us to provide knowledge assistance and training to their respective events and programs. To read about the recognition for our founder Hasina Kharbhih, please click here. To read about the Impulse Model, please click here.